Global warming leads to increased endoysmbiotic archaeal growth which can modulate brain function and evolution. The idea of goodness is based on reason and logic. Reason judgment and logic is a function of the cerebral cortex especially the prefrontal lobe. Prefrontal lobe function needs dynamic synaptic connectivity which is produced by jumping genes mediated by human endogenous retroviral sequences. Goodness is correlated with heaven. The idea of evil is based on the unconscious and the impulsive behaviour related to subcortical areas especially the cerebellum. The global warming and exposure to low level of EMF leads to actinidic archaeal growth in the brain and increased archaeal magnetite mediated perception of low level of EMF. This leads to prefrontal cortex atrophy and cerebellar dominance. The conscious becomes minimal and unconscious brain takes over. 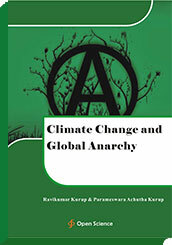 Climate change leads to globalization and a decentralized anarchic world order.